A tropical foliage plant that is also used as an indoor plant, Aglaonema are grown for the large and colourful foliage. These are an evergreen plant, commonly called the Chinese evergreen, and mistakenly as the Chinese Lucky Plant. Originally from tropical to sub tropical areas they are are now widely grown. With over 20 species, it is the cultivars with the very colourful foliage that are most widely used. Foliage varies from a mid green to green with creamy white variation, through to red and green with orange and pink. They grow well in humid environments and do requite a moist yet well drained soil. 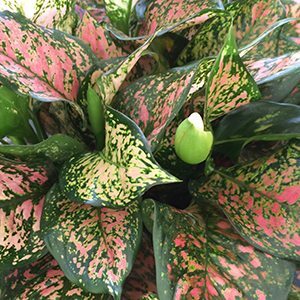 Aglaonema ‘Night sparkle’ is a variety with pale green foliage flecked with pink. ‘Kresna’ is a variegated form, pale to mid green and yellow with pink stems. ‘Silver King’ is an interesting form with dark green leaves splashed with a silvery green. Pruning is generally limited to removing old dead foliage. This is a low care plant once established, however a few basics do need to be provided. Ensure a moist well drained humus rich soil. Plant in filtered light to dappled shade. In containers use a good quality potting soil with around 20% perlite mixed through to improve drainage. Watering is important, wait until the soil begins to dry a little and then deep water, how often will depend on the climate and growing conditions. Increase the humidity by standing the pots on a saucer filled with stones with water in the saucer. The pot will be raised above the water and humidity will be increased. Foliage – Varies with reds, greens and Orange. Flowers – Inconspicuous, followed by red berries.